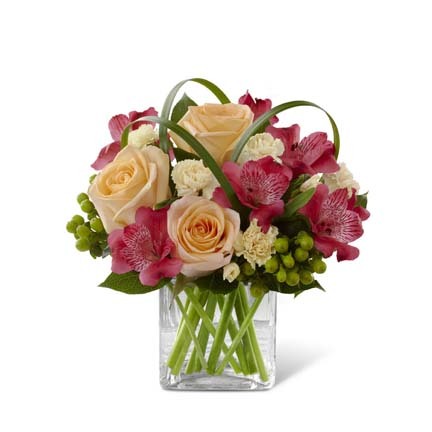 Love in Bloom Bouquet is the perfect expression of sweet affection and adoration. Rich red roses, burgundy carnations, pink Peruvian lilies, pink mini carnations and lush greens are gorgeously arranged in a clear glass vase lined with a ti leaf to create a stunning way to convey your most heartfelt emotions. GOOD Bouquet includes 10 stems. Approx. 13H x 11W. BETTER Bouquet includes 14 stems. Approx. 14H x 12W. BEST Bouquet includes 18 stems. Approx. 15H x 13W.